Garth Fagan, whose gift for illuminating the unexpected in his musical choices and fusing disparate dance forms, takes on a trio of American and South African composers for the world premiere of “Phone Tag, Thanks & Things,” a highlight of Garth Fagan Dance’s Joyce Theater engagement, November 4-9. Voice mails including questions about an upcoming rendezvous, pride from company members anticipating the birth of their first child, renewed contact by a “prodigal” son and enthusiasm from an eager fan are among the compelling messages of mystery, joy and discovery received by Fagan over the past few years. Inserted into the accompanying solo piano music composed by Bogani Ndodana (South Africa), Florence Price (USA) and Wallace Cheatham (USA), performed by William Chapman Nyaho, the messages form the heart and soul of “Phone Tag, Thanks & Things.” At times the choreography embodies the emotional content of the voice mails, while at others the relationship is more abstract, inviting the audience’s imagination. Such dramatic tension is part of Fagan’s creative genius. His choreographic signature reads loud and clear in “Phone Tag, Thanks & Things” as Fagan applies contemporary rhythmic structures to traditional ballet forms and places Caribbean movement into a classical structure. Conventional notions of elegance, grace, discord and harmony are upended and redefined. “Prelude: Discipline is Freedom,” a 1983 work which celebrates Fagan’s unique vocabulary, is set to Abdullah Ibrahim (Dollar Brand) and Max Roach. Fagan’s 2006 riveting premiere, “Senku,” is an emotionally charged dance that suggests the variety and riches of the art form. This season, the company presents the excerpt “Feel/Think,” a solo performed by longtime company star dancer Norwood Pennewell to music by Samuel Coleridge-Taylor. Showing another dimension of Fagan’s humanistic concerns and fervent imagination is “Light,” an excerpt from the 2005 tour de force, “Life: Dark/Light,” a celebration of the bonds that communalize people as reflected in the complex rhythms of Billy Bang’s Asian-influenced jazz violin music. “Translation Transition,” first performed in 2002, conveys a sense of community, once again revealing Fagan’s deep humanist streak. Like the Jazz Jamaica All Stars score that accompanies “Translation Transition,” the dance explores the similarities, differences and meeting points between American jazz and the traditional music of Jamaica (ska, reggae and mento). “Edge/Joy,” last year’s premiere, embodies the singular pleasure derived from balancing at the edge, going eyeball to eyeball with the unexpected. Through Fagan’s radical re-envisioning of the stage space—a great deal of the action taking place along its periphery, its overlapping entrances and exits, sections melding into each other—the dance upsets our assumptions, while rewarding with movement invention and new ideas. The music is by Ricardo Zohn-Muldoon. 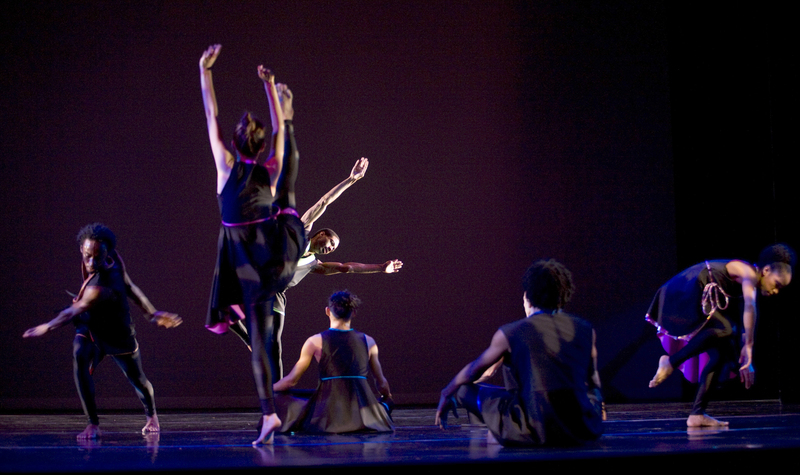 “Edge/Joy” was commissioned by The University of Rochester in support of Meliora Weekend 2007, and co-commissioned in part by The Joyce Theater’s Stephen and Cathy Weinroth Fund for New Work. “Time After Before Place,” Fagan!s contemporary twist on the Adam/Eve/serpent parable, set to music by Art Ensemble of Chicago, is this season!s revival, having originally premiered at The Joyce in 1988. The evening curtains for Garth Fagan Dance’s Joyce season are Tuesday, Wednesday and Sunday at 7:30pm, and Thursday, Friday and Saturday at 8pm. There are 2pm matinees on Saturday and Sunday. Tickets are $49, $35, and $19, and can be purchased online at www.joyce.org, by calling 212-242-0800, or at The Joyce Theater box office, 175 Eighth Avenue at 19th Street. Garth Fagan, a 1998 Tony Award-winner for his choreography for Broadway hit “The Lion King,” began his career in dance by touring Latin America with Ivy Baxter and her Jamaican national dance company. In addition to studying with Baxter, Fagan trained with Caribbean dance teachers Lavinia Williams and Pearl Primus, as well as with Martha Graham, Mary Hinkson, Alvin Ailey and José Limón. A graduate of Wayne State University, the Jamaican-born choreographer served as director of Detroit’s All- City Dance Company and was a principal soloist and choreographer for the Dance Theatre of Detroit and the Detroit Contemporary Dance Company. In 1970, he moved to Rochester, NY, where he founded Garth Fagan Dance. The company has since appeared in many major venues and arts festivals throughout the United States, as well as internationally in Europe, Africa, Asia, the Middle East, South America, New Zealand, Australia and the West Indies. In addition to works for Garth Fagan Dance, Fagan has choreographed dances for Judith Jamison, Dance Theatre of Harlem, Alvin Ailey American Dance Theater and Limón Dance Company. In May 1999, he created “Ellington Elation,” one section of a trio of pieces commissioned by New York City Ballet in honor of Duke Ellington’s centenary and NYCB’s 50th anniversary. Fagan’s choreography for “The Lion King” also won him the 1998 Drama Desk Award, the 1998 Outer Critics Circle Award, the 1998 Astaire Award, the 2000 Laurence Olivier Award, and the 2001 Ovation Award. In 2001, he received the Samuel H. Scripps/American Dance Festival Award; that same year, he was also the recipient of the Golden Plate Award, was inducted into the American Academy of Achievement and was presented with the Order of Distinction in the rank of Commander by the Jamaican government. Additionally, he won the 2004 Helpmann Award. Throughout the history of the Garth Fagan Dance Company, five members have received New York Dance and Performance Awards (“Bessies”): Garth Fagan, Norwood Pennewell, Steve Humphrey, Natalie Rogers and Sharon Skepple.